This thrilling Mauritius and South Africa Big Five safari holiday is based in the malaria free Limpopo Province. Enjoy open top game drives with a lodge ranger in the magnificent Entabeni Game Reserve that is home to lion, leopard, elephant, buffalo, rhino, zebra, giraffe and so much more. Afterwards fly to a luxury hotel on the warm tropical island of Maurius. All game drives, park fees & transfers included. You will be met at Johannesburg Airport and transferred 3 to 4-hours (depending on the location of your lodge) to the beautiful malaria-free Waterberg Mountains, a UNESCO biosphere renowned for its diversity of plant and bird life. After checking into your lodge, enjoy a safari in your Private Game Reserve where game viewing opportunities should present themselves almost immediately. Hope to see several species of antelope, zebra, wildebeest, giraffe and numerous other plains game before dining under the stars. Rise early to take advantage of the best game viewing conditions of the day, and enjoy a thrilling open top safari with a lodge ranger in your malaria free private game reserve, with its many beautiful sandstone monoliths, ravines and waterfalls. 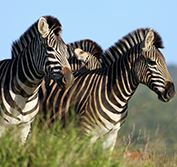 With numerous different species of mammals and reptiles in the park, you can hope to see several of the Big Five - lion, elephant, buffalo, rhino and leopard - as well as many other interesting species such as giraffe, zebra, wildebeest, eland, kudu, sable antelope, waterbuck, warthog, baboon and much more. Bird watching is outstanding and you can see hippo and crocodiles in the dam. Return to the lodge for breakfast and in the late afternoon enjoy another thrilling game drive with a lodge ranger. After a beautiful African sunset, enjoy the balmy evening and pristine stars of the Milky Way as you have never seen them before – as well as the spectacular Southern Cross. Note: Most lodges do not allow children < 6 on open top game drives. After some final game viewing, transfer 2.5-hours from the Waterberg Mountains to Johannesburg. Check into your hotel conveniently situated near Johannesburg Airport. Make your own way by free hotel shuttle or on foot (depending on location of your hotel) to Johannesburg Airport for your onward flight. You will be met at Mauritius Airport and transferred 1-hour to your beach resort. Check in to your hotel, settle in and relax on this warm tropical Indian Ocean island, surrounded by sparkling turquoise waters and coral reefs. Enjoy lazy days relaxing on the white sandy beaches of Mauritius. Swim and snorkel in these sparkling turquoise Indian Ocean waters, participate in a wide variety of water sports and savour fine Creole cuisine - especially the superb seafood. Mauritius offers wonderful scuba diving in its calm clear waters, so this is the ideal opportunity to learn if you have never tried before, with many PADI dive centres. Deep sea fishing is also outstanding, in waters regarded as the best for marlin in the world. Dolphin-watching catamaran cruises are very popular, as well as glass-bottomed boat rides to view the surrounding coral reefs swarming with tropical fish. Golf and horse riding are available, as well as bicycle hire to allow you to explore the island independently. You can visit vibrant Grand Baie, with its pubs and nightlife and shop in the capital city of Port Louis, where you must expect to bargain vigorously. Or join one of many fascinating day tours that explore the history and nature reserves of the island. Transfer 1-hour to Mauritius Airport for your flight home.